ART = CAPITAL = SPECTACLE, 2006. Matthieu Laurette’s first solo show in London focuses on the aesthetics of money. Colourful snapshots and posters from Laurette’s ongoing series of “Déjá vu International Look Alike Conventions” offer refracted images of celebrity and affected images of wealth. Staged in conjunction with some of Laurette’s openings, the gathering of glamorous look-alikes have fooled some art-world attendees and incited frenzied photo-ops. Also aware of how easily money can be overlooked, Laurette’s Slapstick #1 (Money), 2003/2006, uses a hidden camera to document museum visitors obliviously walking past a crumpled €5 note dropped in front of a large Yves Klein painting. Just inside the gallery door, Laurette has installed a work that measures the West End gallery visitor’s concern with money. ART = CAPITAL = SPECTACLE, 2006, gives someone with no more than a £5 note the opportunity to purchase a bill, of equal value, embellished with Laurette’s dramatic, titular equation and signature. The gallery assistant removes Laurette’s bills (fives, tens, twenties, and fifties) from a green metal safe installed in the wall next to examples of Her Majesty’s altered notes. 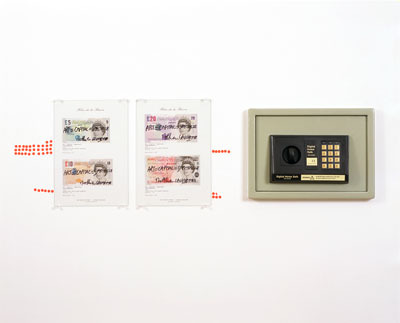 The gallery chronicles each transaction by placing a round, orange sticker on the wall next to the withdrawn bill, indexing the level of attention (and transaction) granted to the work. This is a refreshingly succinct lesson in supply and demand, although the four-and-a-half circles next to the fifty looks very suspicious.